without giving some time to your yarn. So now that the Olympic stress is past I needed something to do in the down time while re-planning the Aran sweater for Kevin. I may have to rip some of that out again but I wanted to be in a calmer state before I tackle it again. Mom has this kewl yarn that she got from Countrywool and we hadn't made any major decisions on what to make with it but I liked the multi-colors in small sections and just had to use it for something. I plan to try a short row wrapped toe to see if I like the way they turn out, the only "design" I'm putting in it is k2p1 ribbing, enough stretch to fit but not so much that they become slouch socks. I freely admit that in the first ohh about 5 rows I HATED these colors and all that was running through my head was "WHAT WERE YOU THINKING!?!?" I hated it so much in fact that I tore out the first 3 tries and on the 4th I pushed on through the first rows and as the knit relaxed into shape the color pattern exploded and I had a complete 180 change of opinion. . . now I wish they were done already I like the color so much!!!!! Ok now that Mom's sent these I have to share them even tho the "final" picture is posted I think it only right to share some of the "trauma" of the final knitting days. My step-father was a registered cat breeder years ago and after retiring took in some of the old breeders to keep them for an untimely demise. These are corats that are not actually built for the cold climate so anyone sitting is in jeapordy of getting "kitty pounced" so they can sap off your body heat. Notice the Coke Zero AND the coffee cup . . .I was prepared to stay up as late as needed to finish on timeno matter what Mouse's plans were!!!!! After we'd gotten done with celebrating the success and cleaning up the bits we had strewn here and there Mom talked me into putting on the sweater. My only reluctance was from the fact that before wind chill was factored in it was all of 2 degrees out. (Notice that the fireplace is directly behind me!!!!) Mom took a really nice picture and I LOVE the fit. Now I just wish this arctic blast we're getting would pass so I could wear it out of the house and not get frostbite!!!!! 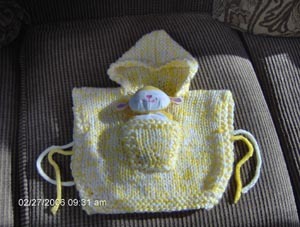 Here's the baby poncho Mom made that she's MUCH happier with. 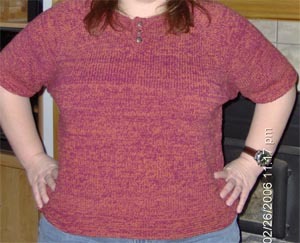 All in all Mom made 2 items in the 16 days of the Knitting Olympics I'm VERY proud of her!!! Mom completed the poncho hood and pocket completely alone only asking me one question about how the pattern was worded. 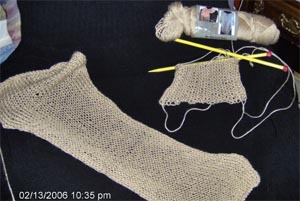 She even went to KNoon to watch a video on 3 needle bind off all on her own and did a perfect job. . .. heck I've never done a 3 needle bind off yet! The small head you see peeking out of the pocket is a soft teething toy for a baby that has the rubber teether feet tucked up in front of him as if he's hugging himself. She had a ball picking out the "perfect toy" for the pocket too. . . .she just seemed to have more fun overall with this one! Ok We got the projects done and I was at my mother's for the closing with the puppies we were weaving in ends as the ceremony was winding down and finished under the wire. Mom had finished hers earlier in the day so as I was sewing in the placket and buttons at the top she was helping weave the ends at the bottom (Mom's are great aren't they!). We had cranky hungry puppies that wanted to get home, my husband had worked all day and also was tired and well the sweater hadn't been showing well in pictures that were taken inside so I posted our completion and left. I had hopped to get a better picture outside in the sunlight this morning but I ended up with the same "picture just doesn't do it justice" type of picture so you will just have to take our word for it, this sweater is amazing in color in person, the pictures just don't seem to catch it as well. My mother first thought I'd changed my mind on the yarn and started using chenille, the colors look that rich in person. I'll post Mom's pictures when I get back from the Doctors later today. Details and pictures tomorrow just wanted to post that we made the closing. I have been worried all along that I might run out of the rust color I've been using because I was only able to get 9 skeins and the pattern called for 12 at full length. I knew I was never going to make it full length (didn't want the sweater all the way to my thighs) but I wasn't sure I was going to be able to squeak out everything and have the length I did want (nicely resting mid-hips). So after some thought Tuesday and a call to Claudia Wednesday to see it my thoughts were in la-la land or on solid ground . .. (believe it or not I was not in left field for once) the decision was made to slip the body to another circular needle after I got it to an acceptable length before the garter edging. 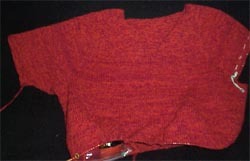 Once slipped I would finish up the sleeves, collar and placket then return the body to the original circulars and finish. This would allow me the freedom to finish with all the yarn I had or to the full desired length instead of the acceptable length whichever came first. So tonight a sleeve was born!!!!!! I had set aside one skein in each color for each sleeve and after completing this one I think I will have more than enough left from the sleeve yarn to work the placket and collar from one sleeve's left over and put the other sleeve left over yarn into the body length. 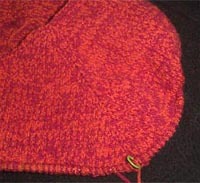 Beauty of sleeve knitting top down is that things get faster as you get closer to the end . . . .what a novel idea!!!! All in all I am more happy with the progress to date, I was beginning to worry because even tho the body was progressing I felt it was a never ending circle and I would never see the light at the end of the tunnel. Now I can see that light and I think reaching it is very possible. Mom is a trooper to say the least. I've told her flat out that she met the terms of the Olympic rules and was free to stop there. 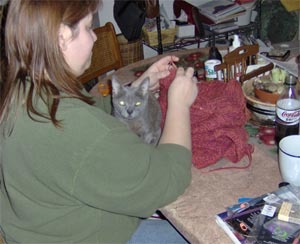 Knowing I was still elbow deep in yarn and knitting she felt bad she'd pulled me away from my work to help her with hers and finished before me so she's picked a 2nd project to start and finish before the closing ceremonies. A baby poncho and well she's screaming along on that one too (o: Mom gets nervous and overwhelmed when she reads ahead in her pattern . . .funny . . .that's what Claudia is always telling me to stop doing . . .well at least now we know where I got it from LOL. She picked the one she wanted to make and I went over Tuesday with the puppy crew to help her get started (while still working on mine) and she's already at the neck line ready for me to come back Thursday night to get past the neck to the back panel. I can easily see her ready to finish off the hood by Saturday evening. Mom helped me select this picture because with a regular shirt behind it you can see the progress better than just on the plain black blanket. With the shawl completed and not totally satisfied with the overall look Mom has decided to make a Baby Poncho from a Lion Brand pattern. 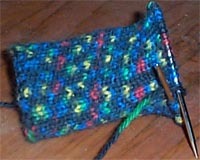 She's using the Simply Soft yarn trippled to get to the gauge she needs. Pictures to come later. Mom has completed her first shawl and we tried it on a friend's daughter. 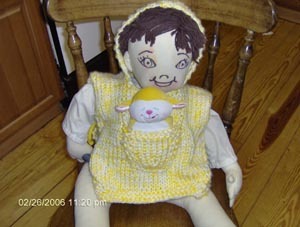 Mom's comment in email was "not thrilled with this )c:" now I don't know what it is she's not thrilled with as I have not talked to her since she sent this mail but there were pictures of her in the shawl too so incase it was the pictures of her she was not happy with I'm not posting them. OK dingbat that I am I forgot to take a picture of my progress but I am still on the body rounds and have added about 5 inches more on the body. I'll post pictures for Monday's update. No pictures today . 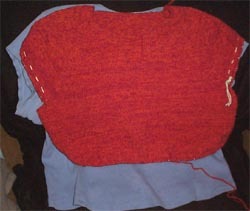 . . .Mom bound off the second panel last night and we figured out how they are to be pieced togeter and she sewed them. When I left her she was doing the edging and I'll check in with her tomorrow after work to see how that went for her. Again no pictures. . . I knew during the week progress was going to be slow and it is. I have only roughly gotten about 2inches further on the body. I'm about ready to finish the skeins I'm on at the moment so I'm making progress it just seems like I'm not when there's nothing to count towards . . .I guess this is the endurance challenge portion of the Olympics . . .no worries, I will continue!!!! 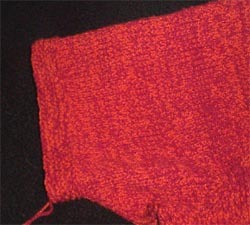 End of day 3 and I have finally gotten the sleeve stitches pulled off onto scrap yarn for later knitting and am now ready to progress with the body of the sweater. It had snowed Sunday and they threatened high winds and power loss so I spent some of my precious knitting time Saturday and Sunday preparing to be without power and gathering water in about everything I could to have enough for the dogs to drink and to use for personal hygene. As it turns out we got nothing much, 1-2" tops and at my house no winds. Oh well on the no snow part but glad about the not loosing power part. Mom's chugging along quite nicely. I stopped over at her house after work today to watch her bind off so if she had any trouble I was right there and ready to help. 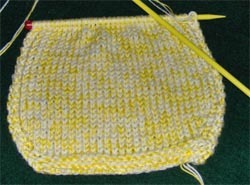 She's completed the first half and has a good start on the second side. We're shooting for Wednesday to have that side finished and then we'll go over her pattern to get her started on finishing off the edges and the fringe. Once this one is finished we'll look at the size (we both think it's going to be a bit small) At that point we'll either increase the pattern to make a larger poncho or pick a new pattern for her to keep working on. 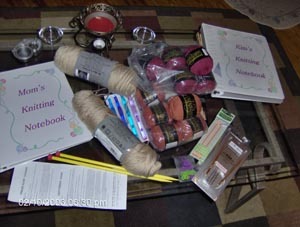 We're officially on the Knitting Olympics list!!!! 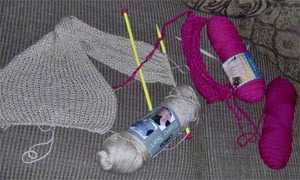 We have learned however that Mom should NOT watch action films while knitting hehehehehe . We were watching "Walking Tall" staring The Rock and there was an explosion from a bomb after a signifigant quiet time in the movie and Mom just wasn't watching. She jumped and threw both hands in oposite directions, problem is that she neglected to let go of her needles. I swear I was laughing so hard I couldn't breathe! To make it even worse the look on her face when she realized she'd not only dropped stitches but pulled them down many rows was priceless!!!! About 10 minutes later when I could see again through the tears I helped her pick up her dropped stitches and figured out only one had pulled way down. 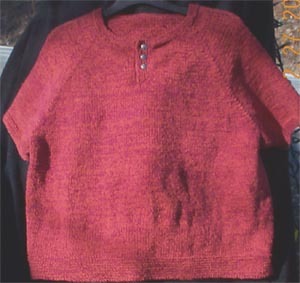 My pattern is chosen and my yarn is ready I'll be knitting a top down Henley for Women in cotton with the hopes that I will end up with a nice summer sweater when the Olympics are over. 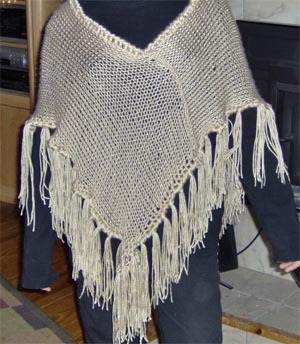 Mom has chosen a nice poncho out of a soft spun yarn that should drape quite nicely. (I'll see if my stepfather can scan the picture later) Both of these projects should challenge us. I will confirm this but I believe the torch is to be lit tonight at 6PM est. With working to 4:30 and having 2 dogs, gathering the remaining knitting items , getting the dogs out for their walk, getting down to Mom's and settling all 4 dogs in while grabbing a bite to eat . . .CO at 6PM is not possible so we're starting ours at 7PM. Edit: 02/10/2005 We may be an official participating tem of 2!!! OK rules state no cast on until the torch is lit soo . .. .here we are ready and chomping at the bit to start. Unfortunately the torch lighting is the last thing to happen . . .so much for starting tonight, we're planning on getting up early and starting first thing at our own houses then meeting up again at mom's for some group knitting time.